Ever since my first visit to Jimoco Cafe & Pasta nearly 5 years ago, I have always wanted to go back for a re-visit. Originally, I was tipped off to the place by a random person eating a torta beside me at Las Tortas (yah go figure). This time around, it was at the suggestion of one of the readers of this blog. 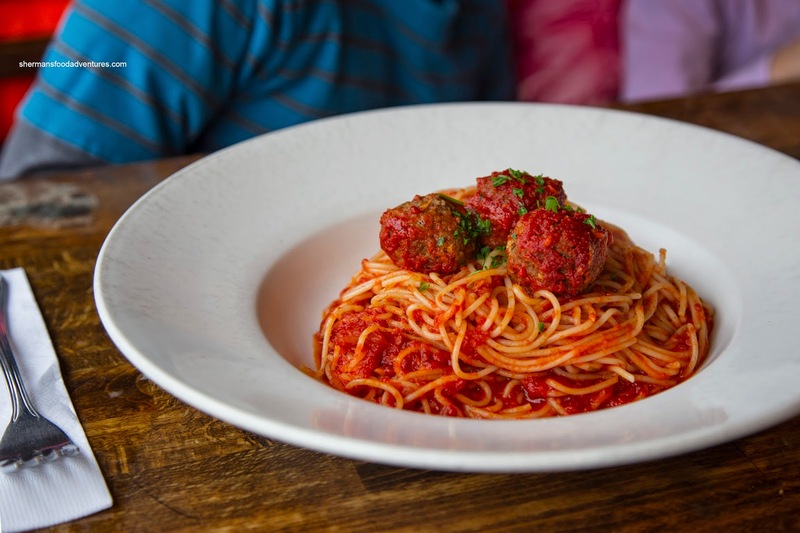 Okay, I needed a kick in the rear-end to do this and besides, they were and still are one of the best values around (also Basil Pasta Bar) for pasta that doesn't involve massive mediocre quantities nor slop that you would find at places such as Boston Pizza. 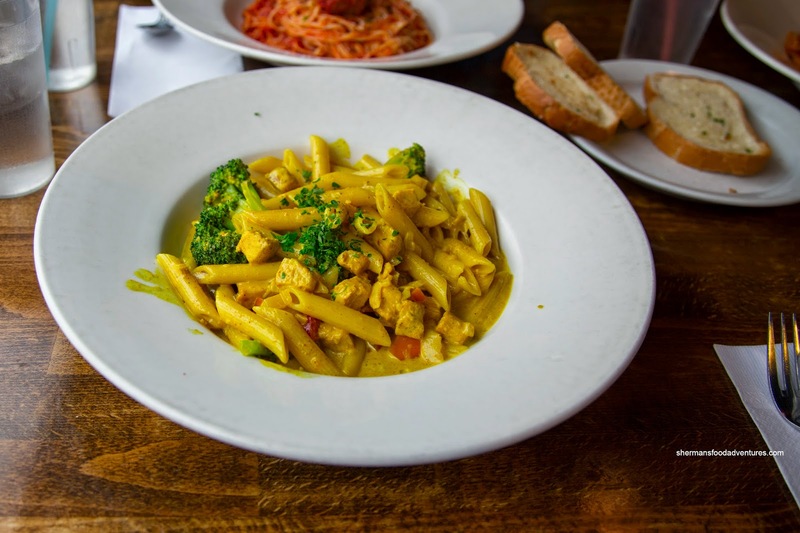 I finally decided to try the one dish that was recommended to me for my original visit - Penne alla Bombay (with chicken, broccoli, chili flakes and tomatoes in curry cream). Turns out that I was missing out because it was pretty good. Riding the fine line between tasting too much like an Indian curry and being too creamy, this had all the good elements of curry while still resembling a pasta sauce. It was not spicy, but did have the flavour of spices with a thick consistency. The penne was sufficiently toothsome while the chicken could've been less dry. 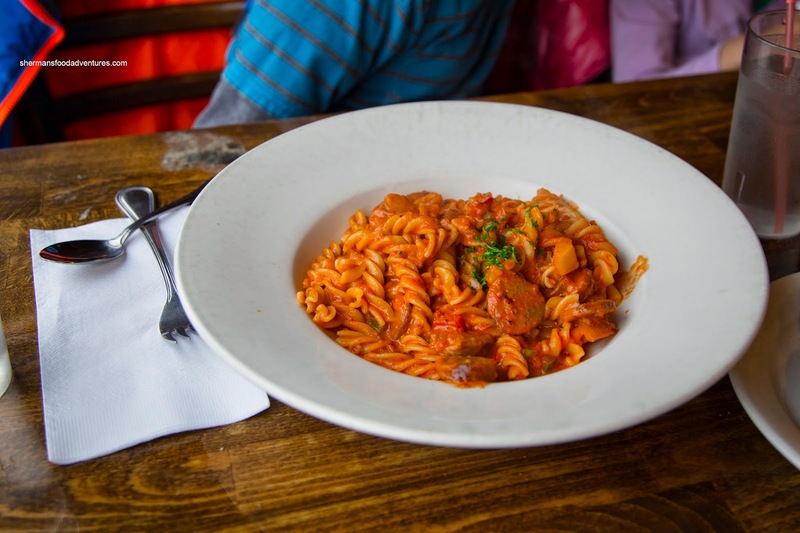 For Viv, she tried the Fusilli alla Salsciccia consisting of Italian sausage, onions, bell peppers and chili flakes in a rose sauce. I found it a bit saucy, yet at the very least, it was not devoid of flavour. There was a nice creaminess accented by some spice. I wasn't a huge fan of the overwhelming green pepper taste though. Since it was 2-for-1, the kids ended up with their own pastas. My son went for the basic being the Spaghetti alla Polpettine (meatballs in tomato sauce). I liked how there was just enough sauce to hug the al dente pasta. The sauce was tart and slightly acidic emanating from the tomato sauce. Although not completely dry, I found the meatballs not overly moist either. They were meaty in taste with enough seasoning. 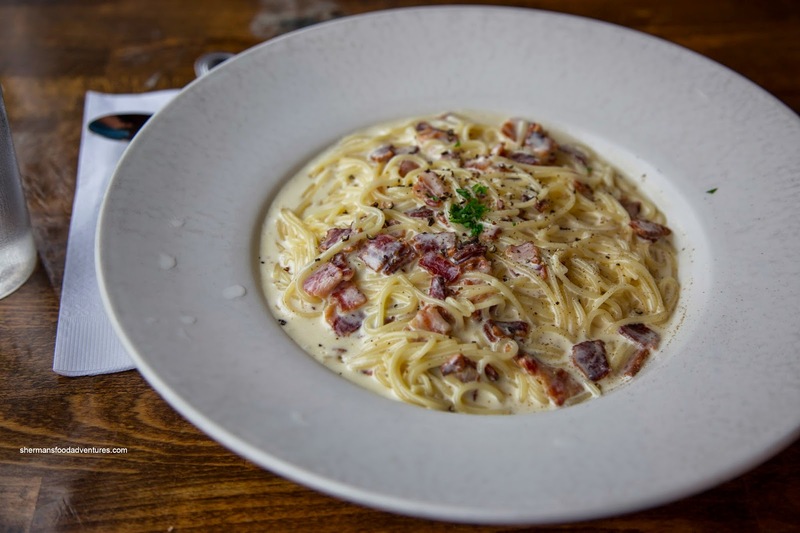 For my daughter, she went for creamy with the Spaghetti alla Carbonara with bacon, egg and Parm in a cream sauce. This was indeed very creamy and rich with plenty of flavour from the bacon and seasoning. The noodles were a touch soft due to all the moisture, but I thought this was the best tasting dish of the bunch. Okay, let me get one thing straight first - this is not an authentic Italian pasta joint. Hence, for all the haters and food snobs out there, please keep that in mind. 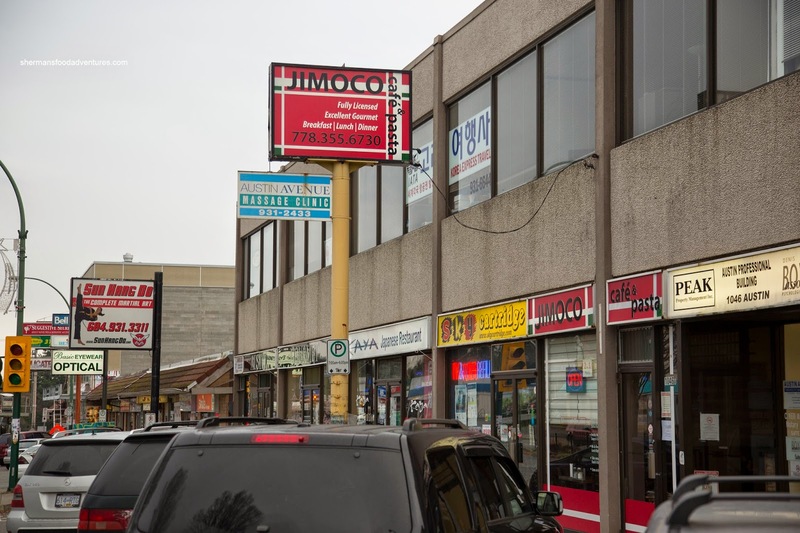 However, for the price and reasonable food quality, Jimoco does what it does well. @LR Yes, the food is better than Anton's IMO, not because it is awesome, but because it isn't a crazy portion of mediocre pasta. Jimoco is decent and just enough for one person.